At the time of my first appearance in 1986, the only characters available for personal appearances were Spider-Man, Captain America, The Incredible Hulk, Dr. Doom, Green Goblin, Firestar, Iceman and Spider-Woman. The latter three heroes aren’t exactly setting the world afire with their notoriety today, and what little repute they had garnered which led to Marvel's creating costumes for the characters was lost by 1986. Firestar and Iceman had earned a place in the pantheon of Marvel's Personal Appearance Program by virtue of their co-starring with Spider-Man in the 1981 Saturday-morning cartoon Spider-Man and His Amazing Friends, running a respectable three years to 1983, with an additional two years of repeats thereafter. Created in 1963 as a member of the original incarnation of the X-Men, Iceman hadn’t been on the team for more than a decade and was not a part of the new X-Men, which featured arguably the most popular and widely known member at the time, Wolverine. And the revamped iteration of the team—though crazily popular in comicbookdom and despite guest appearances on the aforementioned Spider-Man and His Amazing Friends—had yet to achieve the public renown that eventually led to the 2000 film based on the franchise. Firestar was actually created for the cartoon, but made her comic-book debut quickly thereafter. Spider-Woman, aka Jessica Drew (no relation to Peter Parker aka Spider-Man), had the ability to shoot venom blasts from her hands and could glide upon the air currents, using a swath of webbing attached to the underarms of her costume. Despite a mildly successful comic series—which ran for 50 issues from 1978 to 1983—and a short lived Saturday-morning cartoon that aired only sixteen episodes from 1979 to 1980, Spider-Woman was all but forgotten by 1986. You may notice a pattern here: cartoon = live representation of character. But licensing also played an important factor. 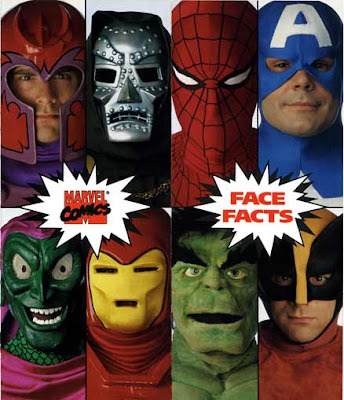 Some early costumed characters in Marvel's stable included ROM, Spaceknight; Crystar, the Warrior; and Destro; all of which were based on toys from which Marvel licensed comic book adaptations, the former with their own eponymous books and the latter a villain in the G.I. Joe comic and cartoon series. By the early 90s, the number of available characters had expanded greatly to include Iron Man, Daredevil, Dr. Strange and X-Men members Wolverine, Cyclops and Storm (some of which are shown in this 1991 Marvel Personal Appearance promotional pamphlet above—that's me in the Spider-Man and Iron Man costumes.). 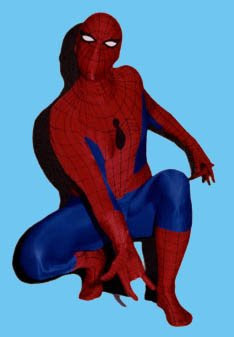 It's pretty crazy that, for the most part, the "official" character costumes for Marvel's PR appearances don't even look half as sophisticated as what modern cosplayers make themselves at home. All these characters are the most exciting one which has been a sensation for almost every aware person. Even at this part of the age I am willing to watch the new series of these heroes.